If you are looking for real ghost videos, photos or stories, here is a right place. Also you will find other paranormal articles, free daily horoscopes, scary ghost games and much more. 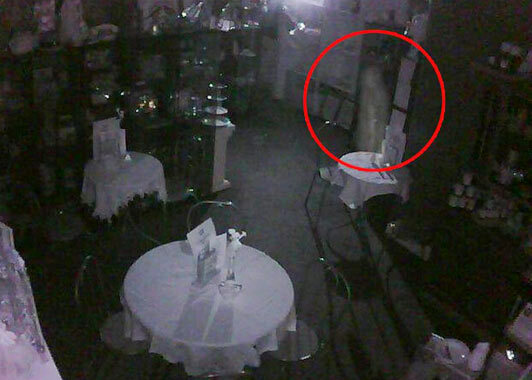 A cafe owner found himself Ghostbuster rather than crime-stopper, when his CCTV camera captured footage of a supernatural intruder. Dan Clifford, 35, was startled by the images of a ghostly female figure hovering in his locked shop, before disappearing into thin air. He said: “The first time I saw the shadow moving on the old camera my heart went nuts as I thought there was an intruder in the shop. "But when I looked closer I realised it couldn’t be a live human being - I could see right through it.” The apparition is just one of a number of encounters with the other side at the Curiositeaz Vintage Tea Room in Perth, Scotland.